In 2018, the Edgewater Development Corporation continued its mission of business attraction and economic development for the Edgewater neighborhood. It was a year of change, where we bid farewell to Executive Director Jennifer Borchardt, and welcomed our new Executive Director, Lauren Guydan. Thanks to our resource tools, partnerships with community stakeholders, and local government, we welcomed over 50 new businesses to the neighborhood in 2018, along with several new or redeveloped residential projects. When coupled with an additional 22 businesses expected to open in early 2019, it is easy to see that Edgewater’s reputation as a business destination continues to grow. 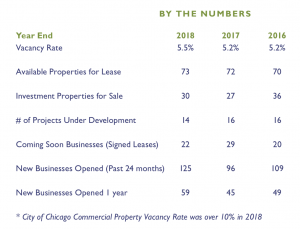 At the end of 2018, Edgewater’s commercial vacancy rate was a very low 5.5%, as compared to an overall City of Chicago rate of over 10%. We continue to see growth in multiple categories, including retail, entertainment, and family-focused businesses. Examples include SoundOff Productions, who have built their online business into a successful brick and mortar operation; The Boxcar at Steep Theatre, an expansion providing additional performance space and a lobby bar; and Edgewater Playhouse, one of the only toddler play environments in the area. If you’d like further explanation of why Edgewater is where you should locate your business, please contact us. We’d be happy to help you find the perfect building to assist you in creating your perfect business. We can help you with site selection, licensing, questions, training and more.